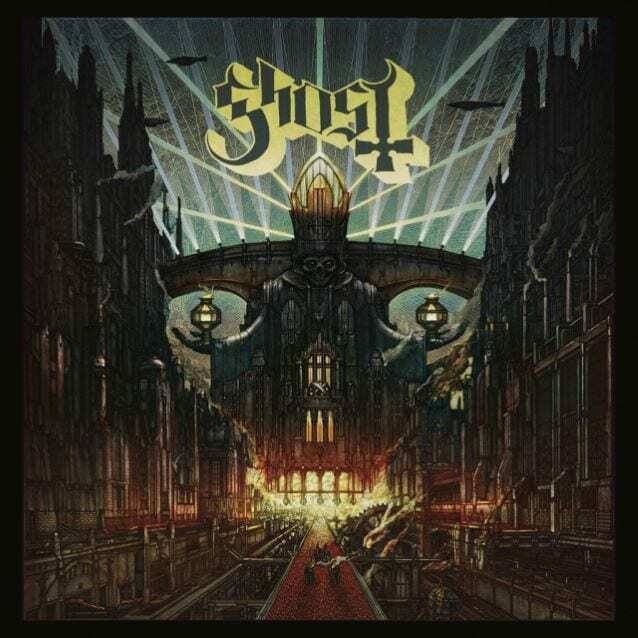 Ghost is back with their third album, Meliora, a name which tellingly means “the pursuit of something better.” As with their first two albums, Ghost continues to recreate the past while pushing new boundaries, and have crafted an album that gets better with each new listen. Ghost has always drawn on vintage inspirations. Their first album, Opus Eponymous, sounded like early Black Sabbath – terrifying and dark, yet rocking and slick. On Infestissumam, Ghost reached even farther back in music history to incorporate more baroque and cathedral choir elements. It was grandiose and looming in its ancient mastery. This time, Ghost is most comparable to Deep Purple or even Celtic Frost. The new music could have come from the doom metal of the ’60s-’80s, emblazoned with heavy guitar riffs, eerie, futuristic organs, and occasional synths. At times, you will surely think this album actually came from an old record store; the vintage sound is so authentic that it takes you back a few decades – or centuries – so that you lose sense of reality. In many ways, Meliora combines the sounds of Ghost’s first two albums. It has the raw energy and guitar riff focus of doomy rock, making it readily comparable to Opus Eponymous, but it also includes Infestissumam’s haunting baroque choirs and grandiosity, albeit a bit toned back. But moreover, Ghost have refined their writing and expertly create a sound that comes straight from the best of the past. Their music could be from the ’60s or ’70s, yet Ghost also adds in their own unique stamp that grounds them in today. Meliora differs from Ghost’s prior two albums in one surprising way: Whereas the previous records instantly grabbed you, holding your captive attention for months from the very first listen, Meliora is more of a grower. The songs are good at first, but they quickly improve with each listen. After the third or fourth play through, you will be hooked. Sometimes the best songs take the most time to fully appreciate, and once you get into Meliora, you will see what a perfect addition it is to their uniquely majestic discography. Meliora is’t just a strong album – it may very well be Ghost’s best album yet. “Spirit” – Meliora has an unexpected beginning. Whereas Opus Eponymous and Infestissumam both began with introductory tracks under two minutes, Meliora breaks the pattern and starts with a full-length 5-minute song. “Spirit” launches with an eerie, spacey synth sound in a retro form of futurism. But the drums soon come in, and Ghost launches into a rock song that would have fit in on their first two albums. Straightforward yet progressive, “Spirit” is offset by a howling choir of voices during the grand chorus. “From The Pinnacle To The Pit” – The second song to be released from Meliora was the booming “From The Pinnacle To The Pit.” Its sliding guitar gives the song loose movement, but the main riff and pounding beat keep the track grounded and heavy. Papa Emeritus III growls during the verses, croons over the choruses, and ominously tells the tale of a fallen angel. “Cirice” – The first single from Meliora was “Cirice,” a dynamic song that continually switches from soft to thunderous. The strummed acoustic guitar that opens the song re-emerges later on, bringing the mood down to something more tender and affecting. But it never lasts long, suddenly crashing into the thunderclapping, pulsing energy that propels the song forward. “Cirice” plays like a love song, but there’s a darker message in there as he asks, “Can’t you see that you’re lost without me?” It’s a risky first single, but also one that can easily appeal to a wider crowd. “Cirice” is a highlight on Meliora, and one of the most powerful songs of Ghost’s career. “Spöksonat” – Instead of a short introductory track, Meliora is adorned with a couple of minute-long instrumental interludes. The first of these is the delicate harp-driven “Spöksonat.” It’s a fragile and brief track, but one that maintains the ancient mood of the album. “He Is” – The oldest song on Meliora is “He Is,” a ballad that was originally written for Ghost’s first album back in 2010. “He Is” brings an entirely new vibe to the album, sounding more like a late ’60s or ’70s folk song. The song starts off with minimalistic strummed guitar, but continues to build up; it’s a floating song that is light despite the melancholy sound of the music. On first listen, “He Is” doesn’t live up to its own hype, but gradually, with each new listen, it will grow on you. Once you are accustomed to the starkly different sonics of the song, it will stand out as an important moment on Meliora. “Mummy Dust” – A definite highlight on Meliora is the grinding and dark “Mummy Dust.” It’s driven by aggressive guitar and gravelly vocals from a man on a mission to “corrupt humanity.” It careens ahead, only slowing down for softer refrain as Papa Emeritus III growls “In God you trust, my mummy dust,” his only response coming from an eerie piano in five terrifying notes. The spacey synths in the bridge keep “Mummy Dust” firmly planted in a vintage time. This is the scariest song on the album, and one that will transport you to a haunted house in an old horror film. “Majesty” – The third promotional song heard from the album was “Majesty.” It’s the most notably Deep Purple-inspired track on Meliora, highlighted by deep guitars and organs. It has a pulsing, chugging beat as the verses build up to a majestic chorus about “our master.” “Majesty” may not grab you until the second or third listen, but it will hold on tight once it does. “Devil Church” – Our second and final Meliora interlude is “Devil Church.” It starts with an organ melody, before drums and a choir join in on the circusy fun. Like “Spöksonat,” it’s only a minute long and is over too soon. “Absolution” – The song rips in with a heavy guitar riff and a sounding bell, and Papa Emeritus sinisterly croons, “Ever since you were born you’ve been dying… Dying to reach the setting sun.” The verses are ominous and dark, but the chorus brings a strangely uplifting mood as Papa sings “Put your hands up and reach for the sky, cry for absolution!” The choruses sound like they could be from a joyful church song in spite of the satanic lyrics. Ghost have successfully turned religion on its head in this celebration of death and demons. “Deus In Absentia” – Meliora closes with a bang, and perhaps the band’s finest final track yet. “Deus In Absentia” has a syncopated, unconventional rhythm, ticked out by a persistent clock sound as the band plays to a circus beat during the verses. The chorus sounds triumphant as he declares “The world is on fire, and you are here to stay and burn with me. Our feet are on fire, and we are here to rebel forever more!” It’s a fun song with an unexpected sound, with swirling piano and Papa’s vocals echoed by an agreeing choir. “Deus In Absentia” ends with 2 minutes of a beautifully lamenting cathedral choir, bringing Meliora to a grand close. You can buy Meliora on iTunes now, or pick out exclusive packages from Ghost’s official store.